I saw this short quote posted on Facebook yesterday and it really spoke to me. It said, “When you’re hurting give yourself permission to hurt. You don’t have to have it all together. Give yourself the same mercy and grace you would extend to others.” I suppose it spoke to me because I’ve been guilty of doing just the opposite. Most of us, I believe, tend to be our own worst enemy. We expect WAY more from ourselves than even God does. The devil doesn’t have to attack us because we do a great job of it most days! We not only need to learn to give ourselves permission to hurt, we need to give ourselves permission to be human. We need to be okay with messing up, even failing sometimes. It doesn’t mean we quit trying and give up, thinking we’ll never get it right. It doesn’t mean we don’t continue to stand on God’s word when we struggle. Yes, we can do all things through Christ who strengthens us. Yes, His power is made perfect in our weakness. Yes, we can be content in all circumstances. All of these things are true, but sometimes we just need to accept, without shame, our frailty, our struggle with our flesh, our hurts and pains and failures. None of these things make us a failure as Christians. They make us human. 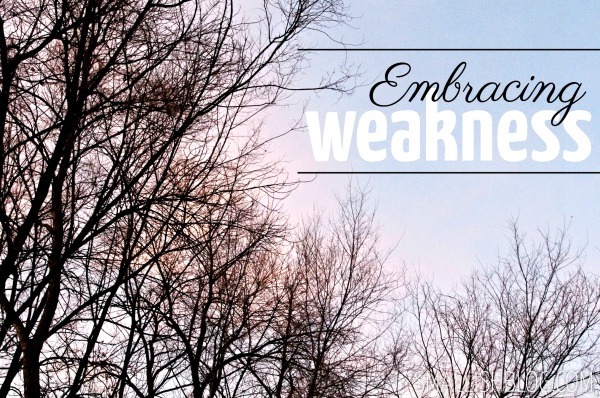 God knew our weaknesses and frailty – before He even made us! And still, He made us anyway. Mind blowing, for sure. Despite what society, or the church, or our culture, or our friends and family think or say, we don’t have to have it together all the time. In fact, I would go so far as to say we can’t. We might go for years trying to keep up that appearance, but eventually something has to give. It could be our health, our relationships, our walk with God, among other things. God’s been teaching me lately it’s okay that some days I don’t feel like praying (gasp, did I just say that? ), or reading my Bible, or being nice to people who are rude, or going out of my way for someone. Some days I just want to be. To not have to think, or talk to anyone, or do what I “ought” to be doing. And it’s okay, because He understands I am flesh. Psalm 103:13-14 says, “As a father has compassion on his children, so the LORD has compassion on those who fear Him; for He knows how we are formed, He remembers that we are dust.” Did you catch that last phrase? He remembers that we are dust. I’ve pondered this passage a time or two. I mean, what exactly does dust do? I know the psalmist is referring to our bodies made of clay, but still. When I think about it, it really takes the pressure off. God knows that me and you are going to have days we blow it. Amazingly, He loves us just the same. His love isn’t based on our performance, our getting it right all the time. His love is based on WHO HE IS. He IS love. He is the embodiment of love. We need to learn to receive His love, for only then can we truly begin to love ourselves. When we love ourselves, we are free to embrace our humanity, our weaknesses and frailities, even our failures, without condemning ourselves. Because He does. At the same time, we don’t want to embrace and settle for mediocrity. We were created for great things that God prepared in advance for us. (Eph. 2:10) As His representatives on the earth, we should be excellent in all we say and do, that we may glorify Him. We have been given everything we need to live this life He has called us to. (2 Peter 1:3-4) Even so, some days we’re just going to be human, and that’s okay. Do you struggle with giving yourself permission to hurt, to fail, to blow it? I would love to hear your stories! Please comment below. Like the Shulamite maiden we are well aware of our darkness – our failures, sins, and shortcomings. So many believers live under a cloud of guilt, shame, and condemnation, believing God must be thoroughly disgusted and disappointed with them because of their inability to measure up. This mindset not only brings continual feelings of despair and defeat, but also causes us to look at others with a critical, judgmental eye. Whatever you look for you will find, and whatever you focus on grows bigger in your mind. Jesus taught that we are to love our neighbors as ourselves, but if we harbor self-bitterness or self-hatred, we will tend to treat others in the same way, causing a multitude of problems in our relationships. We so easily make God in our image, projecting our frustration and anger toward ourselves onto Him; this is just one of many lies we often believe about Him. Yet the truth is, He loves and even enjoys us in our brokenness, immaturity, and weakness. The maiden acknowledges her brokenness but also testifies of her loveliness before God. This is not arrogance or presumption, but rather a correct understanding of the heart of God for His beloved bride. Jesus clearly demonstrated the depth of His mercy, love, and compassion in His willingness to physically become like us, suffer beyond our ability to comprehend, and die in our stead. His heart is always full of tender compassion and love for us because He is love. Through His death and resurrection we have received the gift of His righteousness so that when God looks at us, He sees us as perfect through His blood. He loves us in the same way He loves His Son, the One He spoke of in saying, “This is My Son, whom I love; with Him I am well pleased.” (Matt. 3:17) He placed His Spirit within us, imparting a sincere heart that desires to fully obey Him. Our spirits are willing and longing to please Him in spite of the weakness of our flesh. He sees the end from the beginning so He is able to view us from an eternal perspective as His beloved bride who will walk in obedience to Him forever and ever. When God calls us lovely, it is because of these things; He doesn’t look at the things we look at; He sees beyond the surface. Just as a parent loves and enjoys their child completely at every stage of their growth and development, He loves and enjoys us in ours. He knew what He was getting into when He chose us. He is not disillusioned with us, for He never had any illusions about us to begin with. He knows us completely and enjoys us as we grow and mature in and through Him. Ask Him to show you how He sees and feels about you! Do you believe God enjoys you in your weakness? If not, why not? Comment below.